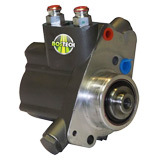 Installing a high pressure oil pump sounds extremely difficult but it can be fairly simple. The first thing that you will need to do is check to make sure that you take the proper steps to avoid any serious injuries that can occur. Once the proper safety measures have been taken, you can proceed to installing the high-pressure oil pump. First, you will want to prepare and collect all of the engine oil that the pump contains. The oil will be located in the back. Once you have done this, you can safely remove the end plug and get rid of the o-ring. Keep in mind that the port will still drip a little oil, so use a rag or a container to collect the excess. Now you can remove each of the high pressure oil hoses. There should be two. Using the special tool that is figure No.6, use the quick release method to remove both of the fittings. Once you have done this, you can get rid of the discharge fittings and the o-rings. Once you have removed the spring, make sure that you check the assemblies with the needle nose pliers. Make sure that both of the fittings and end plug ports are clean. In order to clean them properly, make sure that you use a bake-cleaning product. Now you can apply the Locite 680 sealant. This sealant should only be used on the first three threads on each of the discharge fittings as well as the end plug. Not it’s time to install the discharge fittings to the pump. Once you have done this, install each of the high-pressure hoses. Make sure that you have installed the end plug and torque. Now you can start the engine and check for any leaking oil. If you need to, check and correct the oil level. Keep in mind that cleaning these items properly is critical for the proper performance. Make sure that you clean each item thoroughly to ensure high quality performance.